Dr. Carey, Richardson and Marilyn Jacobs Preyer Distinguished Professor in Breast Cancer Research, is board-certified in Medical Oncology. 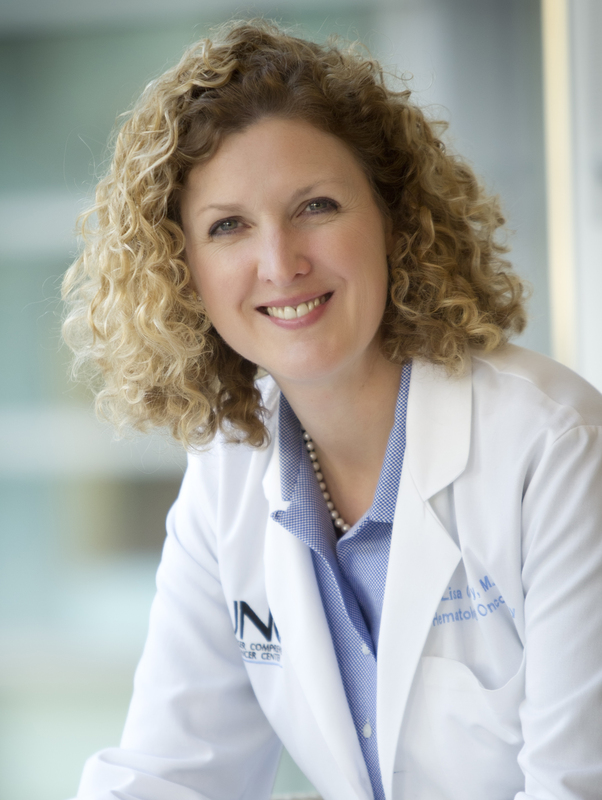 Her clinical interest is in breast cancer, and she is the Chief of Hematology/Oncology, the Physician-in-Chief of the N.C. Cancer Hospital and Associate Director of Clinical Sciences at Lineberger Comprehensive Cancer Center. Dr. Carey’s research interests focus upon breast cancer, including examination of different subtypes of breast cancer, evaluation of new chemotherapy agents in early breast cancer, and examination of tumor characteristics that predict response to therapy. Dr. Carey has worked extensively with scientists across Lineberger Comprehensive Cancer Center and the UNC Gillings Global School of Public Health to better understand and characterize the molecular subtypes of breast cancer so that we may develop better prevention and treatment strategies. With Drs. Perou and Millikan, she identified the elevated risk of the poor-prognosis basal-like breast cancer subtype in young African-American women. She is a world-wide expert in triple negative breast cancer, and led the first trial looking at a new drug regimen in this breast cancer subtype. Members of the UNC Breast Center have a long commitment to improving treatment of early (nonmetastatic) breast cancer, and have been early investigators in the use of neoadjuvant, or preoperative, chemotherapy for breast cancer. In part based upon work performed at UNC, we now know that women do just as well if their chemotherapy is given before surgery as after, however the chemotherapy-first approach means that they are more likely to save their breast. In addition, with preoperative therapy it is possible to tell if the drugs are working since the tumor is still measurable when the chemotherapy is given first. Part of Dr. Carey’s clinical research program investigates new drugs and combination of drugs in preoperative therapy. As part of this neoadjuvant chemotherapy program, she is involved in several studies, including a multiinstitutional trial sponsored by the National Cancer Institute, of genetic and molecular markers in breast cancer as predictors of response to chemotherapy, and she is the lead investigator of a national study of new drug combinations in HER2-positive breast cancer. Dr. Carey is also the principal investigator of a highly collaborative study examining genes that might interact with other genes or with the environment to impact on a woman’s risk of developing breast cancer. She serves in national leadership roles on the National Cancer Institute Breast Cancer Steering Committee and the NCI-sponsored Alliance Translational Science Executive Committee, and the Translational Breast Cancer Research Consortium Steering Committee. Dr. Carey was selected co-chair of the Alliance National Cooperative Group Breast Committee in 2016. For her work, she was awarded a Doris Duke Clinical Scientist Award in 1999, a career development award from the National Cancer Institute in 2000, was inducted into the Johns Hopkins Society of Scholars in 2008, was honored to serve as UNC’s commencement speaker in December, 2009, received the NCI Director’s Service Award in 2011, and was selected to the “Dialogues in Medicine” panel in honor of the New England Journal of Medicine 200th anniversary. In 2016, Dr. Carey became the Breast Committee Co-chair of the Alliance for Clinical Trials in Oncology.